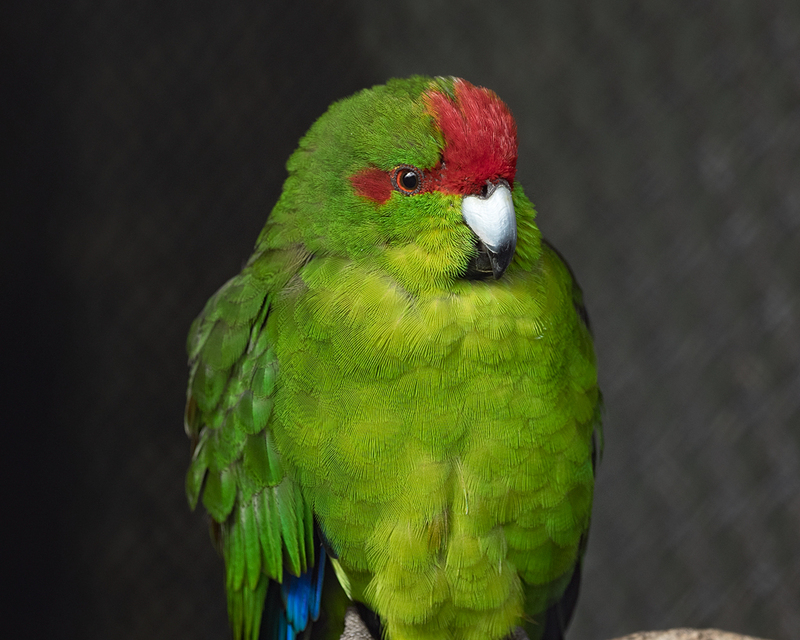 However, the aviaries in the Palmerston North esplanade offer a chance to see kakariki up close, so I stopped by this morning and photographed this bird through the heavy mesh. Careful processing got rid of the inevitable, strong haziness caused by the out-of-focus mesh. I hope one day a photograph like this will be possible in the wild around here. In the meantime, maybe I'll have to plan a trip to the Zealandia Sanctuary or Kapiti Island, or maybe even to Tiritiri Matangi. "Harrummph." Bird is it's own Bird, dammit. Zhoen — maybe I ruffled its feathers. When I lived in Wellington I often saw kakariki flying around Brooklyn - even, on two occasions - saw them in our garden. I expect they were attached to Zealandia. I can recommend a trip to Tiri Tiri Matangi. If you can, stay a night or two there. So much bird life to be seen there that you won't see elsewhere. Anne-Marie, thanks for the recommendation about Tiritiri Matangi. I remember your tales from there, and they made me keen. I've been thinking about a trip there for a while now, but it might have to wait until next year. Zealandia, on the other hand, is much easier and cheaper for me to get to. Matiu/Somes Island in Wellington Harbour is supposed to be very good for kakariki, too, and that's just as accessible as Zealandia with the bonus of a short ferry trip.